There is nothing like a good timeline to tie lots of subjects, people, places, and events together. Sonlight Book of Time with their sticker images from Homeschool in the Woods. Our family has been a family of timeline makers since our early Sonlight days. We used Sonlight’s timeline book when the boys were younger along with their timeline figures. It was a handy way to get started with timelines. 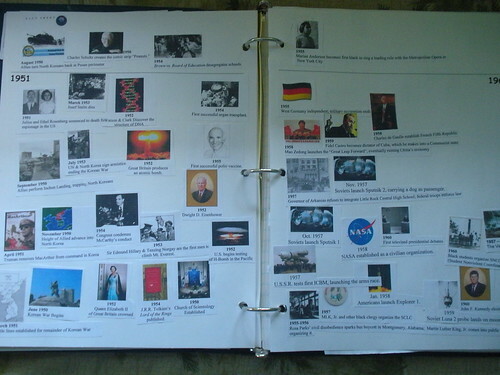 3-Ring Binder with images from Wikipedia and short typed captions to go along with Tapestry of Grace. Along with our Tapestry of Grace studies, we started making our own timeline pages and the boys found their own clipart and images. Spiral Bound Sketchbook with pages adhered for each year…Mr. A’s choice. 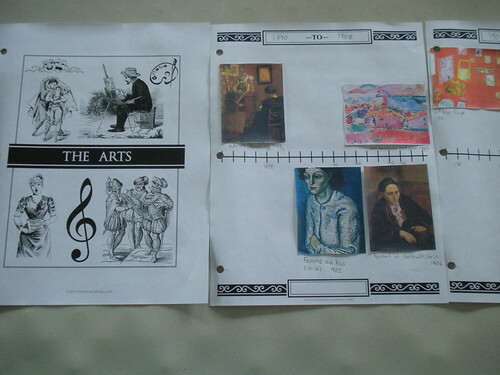 Mr. A preferred to make pages on the computer with images and then to print them out and adhere them into a spiral bound notebook. 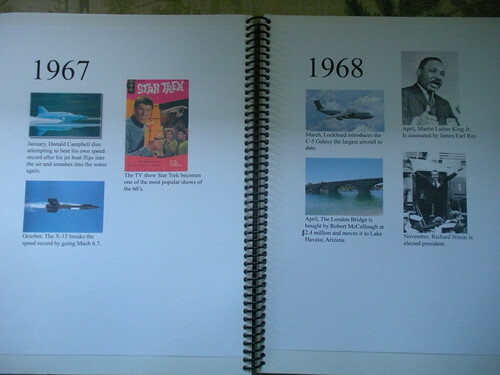 Now that Notebooking Pages.com has introduced their new timeline product, we are using these Book of Centuries pages to customize with our own images. Debra does offer a growing library of pages to go with your timeline and she is releasing more images each month if you are a Treasury Member. In our high school study we are not using a large timeline that encompasses all our studies like we have done in the past. Instead, I am assigning shorter sections with a particular focus. Modern Times Base Pages from NotebookingPages.com with images from Wikipedia for Modern Art. She also has divider pages that you can use as a cover or a marker….ready to be colored in with colored pencils or markers. Love it! Mr. A is using NotebookingPages.com‘s Book of Centuries base pages to make an art timeline of the 20th century. Mr. A found this to be an easy way to make a narration showing his research…images from Wikipedia. The pages available make it easy and does not take up a lot of his study time to put a beautiful timeline together in just a few minutes a week. 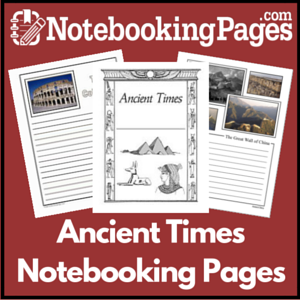 Ancient Times Base Pages from NotebookingPages.com. Mr. B wanted to sketch from his history reading. 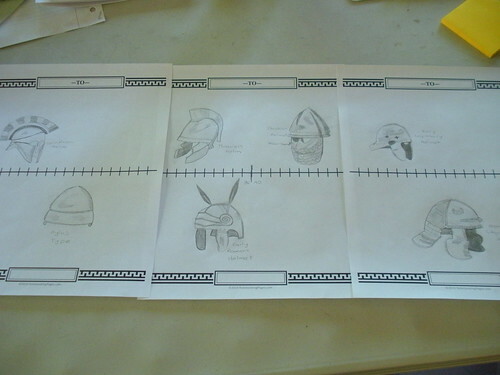 Mr. B sketched up a timeline showing various helmets used in warfare during ancient times. 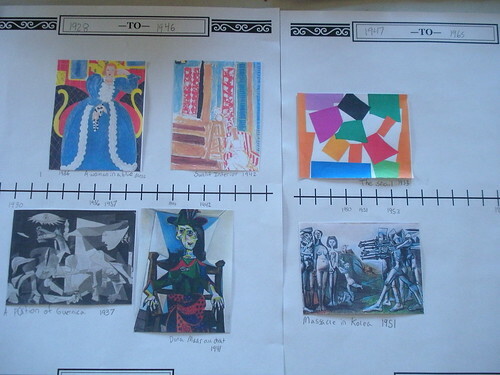 It was super easy to pull up the Ancient Times set, print off the required number of pages and have him complete the project as part of his history study. I love that he is able to easily personalize his narration to fit his mood. He said that he really likes this kind of project and requested more pages for next week. I would say that is recommendation indeed coming from a high school age student. Do you think I will provide some pages? I am already thinking that his study of Paul needs a timeline of his travels. I will share when he finishes. I highly recommend the Book of Centuries set of notebooking pages which are included in your purchase of the Treasury Membership. The Book of Centuries and Timeline System that she has put together is much more than just timelines. You get spine labels, divider sheets, title pages, and additional pages which will make your timeline more like a unit study of the time period under study. 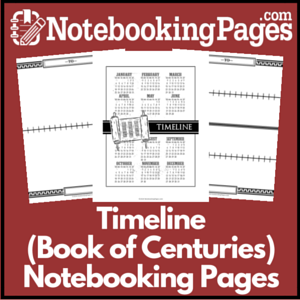 The Book of Centuries notebook pages are just a small fraction of the pages available if you have a Treasury Membership. You have a wonderful collection of BOCs – and I love how personal each person’s pages look. 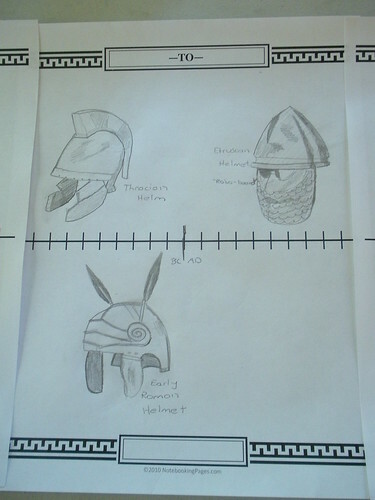 I especially love your son’s helmet illustrations! Thank you so much for this post! I have to admit keeping the timelines has completely defeated me. Thanks, Barb. 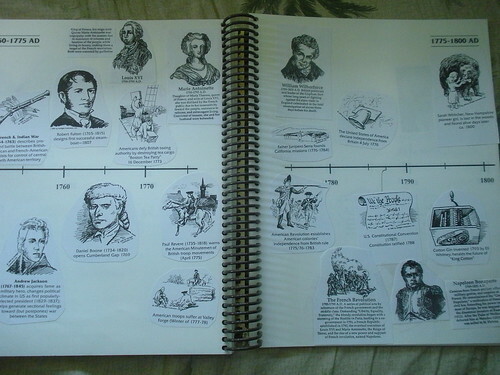 I am a Notebooking Pages treasury member, but was a bit stymied on putting the timeline pages to use. As always you have the answers! What a great time line books your sons have made. Very inspiring. Thanks so much for this! We’re starting a timeline for the first time this year, I think this is going to be a wonderful resource for us. I’ve let my Treasury Membership lapse, so guess I should renew it! Thanks for sharing these resources and ideas with us at Trivium Tuesdays! I especially like the look of those Timeline Figures. I’m excited to start our first (very basic) timeline this fall with my little guy.